We are experts on the products we sell! 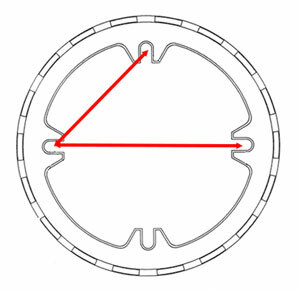 Outside Diameter (O.D.) - Measure from rim to rim. Simply catch the hook of your tape measure on the rim, pull tight, and measure 180° directly across to the outisde edge of the opposite rim. Outside Diameter (O.D.) - Turn the dome upside down and catch the edge of your tape measure on the dome's outside edge. Measure 180° across to the opposite outside edge. If there are locking tabs on your dome, do not include them in your measurement. Height - From a flat surface, simply measure from the base of the dome to the highest point. Do not include any standoff tabs on the bottom of the dome. Copyright Protech Products 2009-2016. All Rights Reserved.